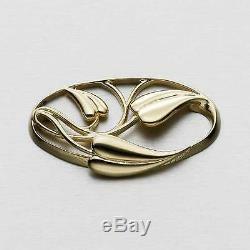 Cecily Brooch Pin 9ct yellow Gold. This lyrical design draws inspiration from flowers and natural forms, as well as the vision of the Arts and Crafts Movement. Its shapes blend elegant, delicate curves into sweet harmonies of precious metal. This new Cecily brooch is designed by Ola Gorie and hand made by highly skilled craftsmen in the Orkney Islands off the north coast of Scotland, marked OG 375, hallmarked in Edinburgh. Has a good quality hinge catch and pin on the back. Hand made in the Orkney Islands, Scotland. Dimensions: around 3.5cm x 2.00 cm. Supplied with lovely new Ola Gorie presentation gift box as shown on other listings. Ola Gorie is one of Britains most important jewellery designers of recent times. A pioneer in the 1960s, she explored her Celtic and Norse heritage to find inspiration for stylish, wearable, modern jewellery. Her designs have continued to break new ground, and influence a generation of designers. Her early pieces quickly gained approval at home and abroad, and her name became synonymous with stylish, finely crafted jewellery. She was awarded an MBE in 1999 in recognition of her work both as a designer and as a founder of the modern jewellery industry. This honour was welcomed by the many loyal customers and collectors of Ola Gories jewellery around the world, as fitting recognition for the long-standing quality of her designs. 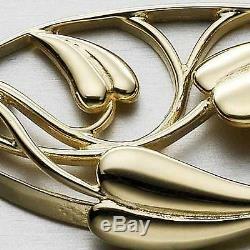 The item "Scottish Ola Gorie 9ct Yellow Gold Arts and Crafts Brooch Cecily" is in sale since Thursday, October 17, 2013. This item is in the category "Jewellery & Watches\Fine Jewellery\Fine Brooches & Pins\Precious Metal without Stones". The seller is "shawn29664" and is located in kirkwall, Orkney. This item can be shipped worldwide.